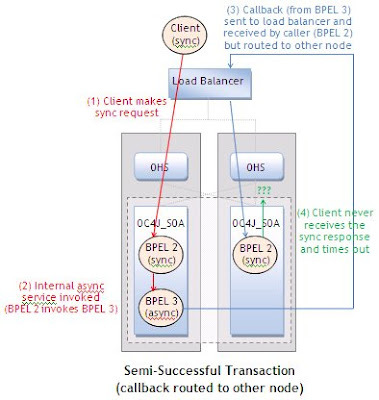 For one of my customers, I was involved in extensive high availability testing of an Oracle SOA Suite 10g (10.1.3.3) cluster in order to determine the behaviour of BPEL processes during failover of BPEL Process Manager. Today, I will be briefly describing test cases 2 and 7. 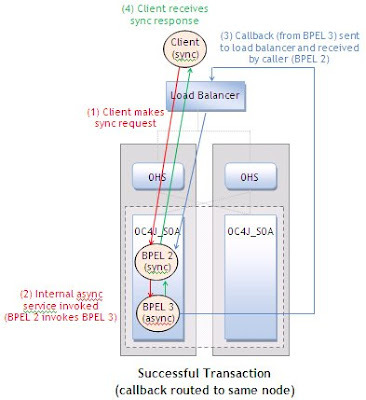 This scenario is simple: An external client invokes an asynchronous BPEL process. If the asynchronous BPEL process is in-flight on the first node and that node crashes (e.g., OC4J_SOA dies), the process is automatically resumed on the second container and runs successfully to completion. Since no response is expected by the client, operations resume normally. This scenario is somewhat complicated: An external client synchronously invokes a BPEL process which in turn invokes another asynchronous BPEL process. A synchronous response is returned to the client. No response is sent to the client, in which the client eventually times out. 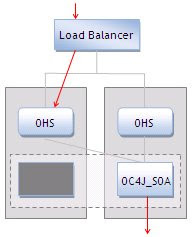 Therefore, this scenario has a success rate of (100 – (100 / # of OC4J containers in cluster))% during normal operations. Red lines --> Request made by client. Blue lines --> Callback from 2nd BPEL process. Green lines --> Synchronous response to client. We have a process that is almost similar to TestCase:7, when it was deployed on a cluster, consumers were not getting response some times and they were timed out..so we decided not to deploy this process in a clustered environment and we raised an SR with Oracle for a solution..i am just wondering if you have found any solution for this..would appreciate your input. The process will finish execution in all cases, but the client will either receive a response or it will time out, as you have been experiencing. Unfortunately, the only recommendation is not to use asynchronous callback for process development in a clustered environment. We faced the same issue, but managed to solve it by doing the callback to the actual node where ohs thread is still waiting. where ns1 is the namespace for Async partnerlink. It should not matter which one, as the type is the same. for the partnerlink of async process. - modify mod_oc4j.conf to enable local affinity when apache calls oc4j. That should definitely work, as long as OHS is routing to a single OC4J. Thanks for this interesting and helpful post though I read it only now(during 11g). I'm interested in knowing the test results for scenario 5 & 6, could you please post them? This is a great thread. We have the same issue in our clustered 10g environment. We got around it by setting the soapCallbackUrl to the local server name in each node's bpel\...\collaxa-config.xml. this ensures that the righ node will receive the callback. Obviously this limit's the HA benefits in pure Async flows. We were told that this will not work in 11g, and if you want a Sync service to call Async services, you'll need to do it in OSB. Anyone aware of any other solutions? This is a very popular pattern in our environment and one of the key reasons we purchased SOA 10g. I am facing Test Case 2: Asynchronous Transactions .Actually i am call one Asynchronous process into another Asynchronous process and i am not getting response from same node1.Could please tell me how to i ensure call back to same node. I posted my response there. Ideally, this short article splashthat.com/ offers complete details Click Here concerning exactly what is TUTU Helper as well as How To Install Tutu Helper App For Android, Iphone & Windows Pc its attributes. I wish you taken pleasure in the post. Tutu App I desire you have a satisfying TuTu Helpers experience with App. As the testimonials go, the weather tackk.com/ conditions do not affect it and the Refer cover continues to fit the grill perfectly. Best Outdoor Grills 2017 (Updated) This brand-new cover resorts to Best Outdoor Grills be lighter, looser, as well as extra Outdoor Grills 2017 flexible to suit the attached storage bag.